The title arrived in a magical way. Every title idea that came to me felt just wrong altogether…until i remembered that what happens in this vision has no mental definition at all…. A pure spontaneous experience can be spoiled or limited (put in a box) when the mind is put to task to define it. But then, sometimes the word used can be a kind of bridge or trigger…and can deepen the meaning of an experience. This title does both… for me. This image feels auspicious….to me….almost like a blessing. **As a side note: My website and blog are a year old now, and during this time my art has been changing, along with me….and i would love to hear (read) from those who are visiting, so i know who you are! A small comment would be very welcomed to begin this new year. So, that said, I have marveled at the changes in your Art Jan in the last year. It is astounding, how you just broke out of the mold that you yourself had very successfully been painting in for decades, and ripped a canvas almost in two and broke free of the goddesses, and the perfection, and showed us bleeding smashed hearts, sensual orbs, with zen flavored- carnival colors, and now this beauty that goes beyond words to describe what can not be described. You take us to the Speechless place, of just being in the moment of another of Life’ miracle gifts..You float an energy, a feeling of lightness, and goodness, right past our faces, and then you show us where these floating entities(?) were born. This rich texturing of almost the cosmos, and then too could be strange altered tree bark that has been painted for centuries by molds, and fungus, and water..I feel the core of the earth, and the blue of the sky, and yet it goes beyond all of what we can perceive with our senses, and just hovers in its perfection and fragility, guiding us to our own conclusions..angels? aliens? 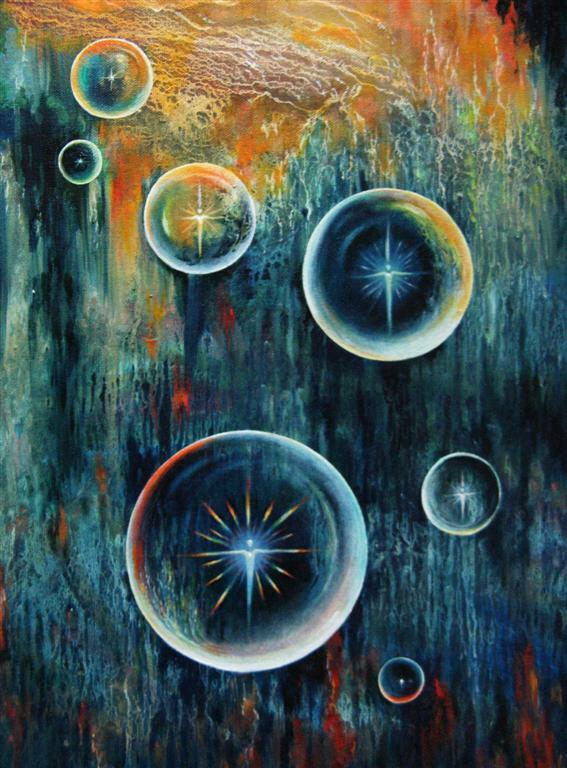 bubbles from a parallel world? Just light Beauty that you found the perfect title for..and yes for me titles are very important on visual Art, especially abstract Art. This is just beautiful, so rich in layers and yet so light and free. I look forward to all the new beauty you will continue to share with us Jan, in this new beginning year. Bravo my dear friend…Bravo…. Thank you so much Karima!! Yes….the comments and feedback are wonderful, often inspiring, to receive from people who have their own impressions and perceptions and feelings to share! Many people who visit our blogs don’t leave comments….which is OK, too. We both have so been inspired by posting our art forms in a blog! This form of communication, putting my art “out”….and then actually finding WORDS for my art, ….has been a NEW adventure for me…it has enriched my own relationship to my art in ways i did not expect! Your words continue to astonish me…speaking from how profoundly you went into experiencing this painting! Wow!! What you wrote reminded me of the inspired poetry that comes out of you when a piece of art touches your delightful, prolific “Muse”…:) What you said here was poetry to me…and has invited me to take another still deeper dive into this painting!!! But you find words that magically increase this vision’s potential for those who care to dive in…past them. Thank you so much Karima for your abiding support and your creative brilliance, not just in how you express your own art, but in how you See the art of others…and share it. Speechless says it all (is that ironic or what!). It images (no small trick) a state of Being where no words are necessary, where words would only detract from Angelic perfection. It’s now my desktop photo, and Jan is my artist muse and best friend and spiritual ally in Costa Rica. WOW!!! Jeff…thank you so much!!!! We get that. What a Gift…ya? Ally’s we ARE….Bless you!!!! Jan you never seise to amaze me. Your creations take me on a journey. I feel like I can stare into them for hrs, days and nights finding new meanings and ways to look at life. Kari!! I am so delighted that you visited my cyber attempts at communication. Yes!! So fun, my latest art has just been dancing, and i am having the best time celebrating it!! It is wonderful to have awake eyes such as yours to dive deep into the images and allow them to take you on a journey. This one, Speechless…was an interesting journey for me as well. 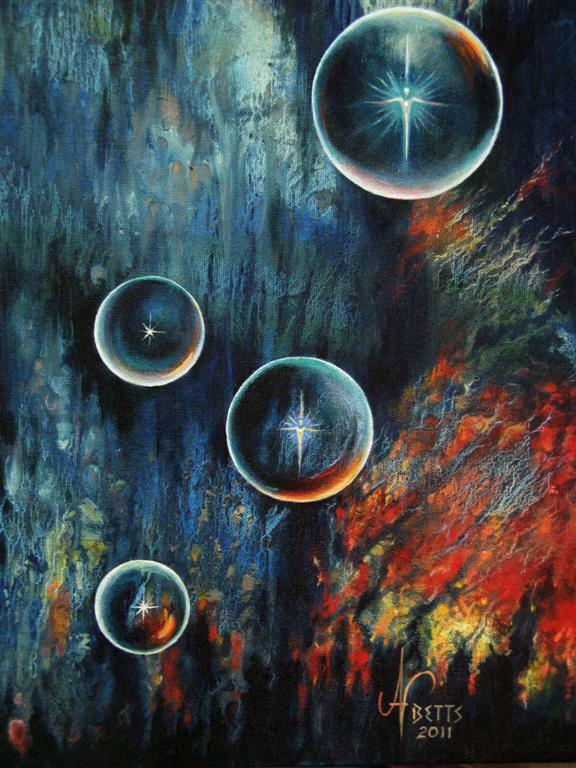 The painting organically flowed into being….and after the bubbles formed, i was moved to put little stars of light in them….and then….One of the stars turned into what felt like an Angelic Force…and i was just joyful to feel the energy that came in at that moment. Thank you so much for your comment!! !